Combine the flaxseed and chia seeds with 6 tbsp and leave until it's gelled and thickened – this will take 10ish minutes. Whisk the spelt flour with the almond milk and water, then add the flax and chia mix. Oil the waffle iron liberally with your oil of choice – you don't want the waffles to get stuck! Pour the mix in, you will probably need to spread with a spatula as the mix is quite thick. When they're golden and cooked through top with whatever you like. 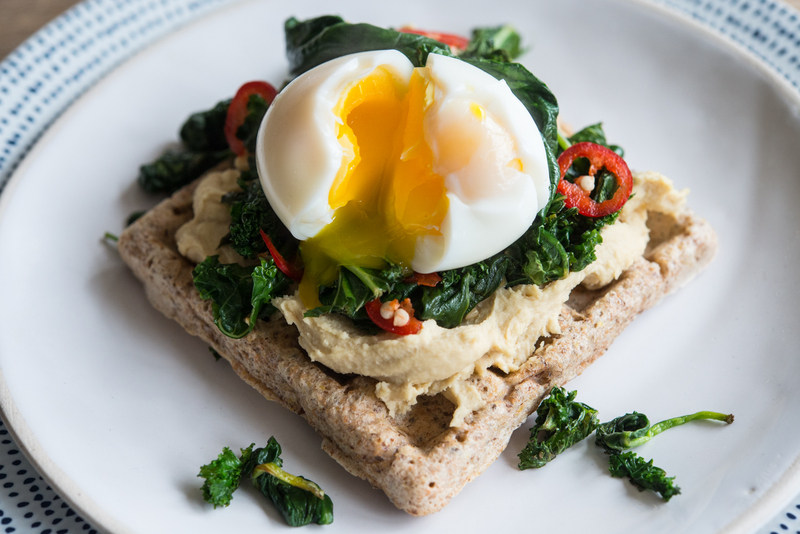 I went with houmous, sauteed chilli kale and a boiled egg. They're also great with classic fruit and maple syrup too. Flo is a Health, fitness, wellness and most importantly food fanatic! Try out some more perfect training fuel recipes created by Flo and if you make these, make sure to tag her up on Instagram @ swift_eats.